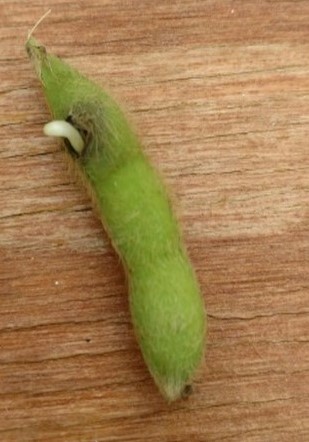 We’ve received a few pictures from around the state of green soybean pods splitting and also seed sprouting out of pods. While it is not uncommon to see pre-harvest pod shatter just prior to harvest due to re-wetting of dry pods, the pictures we’ve received have been of soybeans at the R6 growth stage. To estimate soybean yield, four yield components need to be considered: plants per acre, pods per plant, seeds per pod, and seeds per pound (seed size). A printable worksheet to estimate soybean yield can be found by clicking here. New for 2017- A link was added to the top of each table to download the data to a spreadsheet. Pre-harvest and harvest loss of grain can result in significant yield reductions. Pre-harvest pod shatter (breaking of pods resulting in soybeans on the ground) can occur when dry pods are re-wetted. This year, in our trials, we’ve seen very little pre-harvest loss.